What is a broad fork? The broad fork, also known as a hand tiller, is a wonderful tool to have for breaking up hard pan and aerating soil. 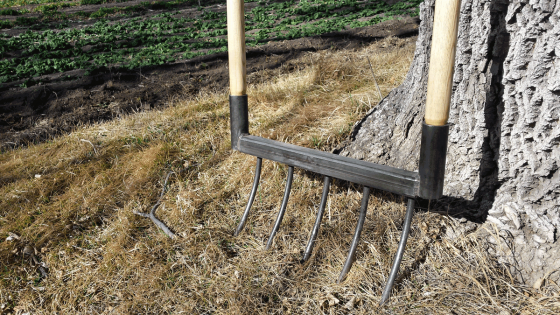 Built from salvaged steel tubing and tines formed from vehicle coil springs, the broad fork is built for heavy duty use in the garden. This is an excellent choice for market gardeners, urban farmers or serious hobby gardeners to turn up lots of soil quickly. Crafted with longevity in mind, all the pieces that go into making it are chosen specifically for their durability and quality. The handles are made from carefully selected ash and oriented in such a way as to minimize the chance of them snapping from prolonged use. The handle sockets and crossbar are thick-walled steel tubing that won’t warp or bend and the tines are made from very tough and durable spring steel. Finally, the entire tool is finished with a mixture of boiled linseed oil and turpentine to protect it from the elements. Applying a thin coat of oil at the end of each growing season before putting the tool into storage will ensure the wood stays flexible and the steel free from rust. Why use a broad fork? Rototillers of all shapes and sizes till the soil to a maximum depth. Repeated tilling at the same depth, as is typical for spring and fall preparation, eventually creates a hard, almost concrete-like layer that prevents drainage and plant roots from penetrating deeper into the ground. 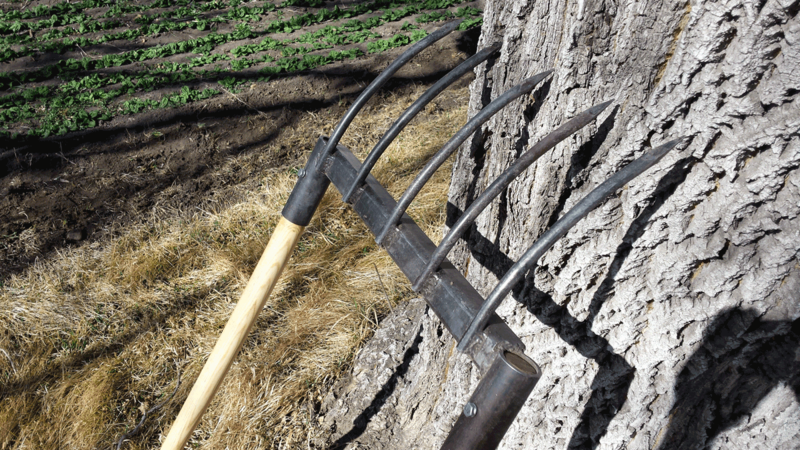 The broad fork, with it’s long, 9 1/2″ tines (or longer) pierces that hard layer and breaks it up, improving the quality of the soil. 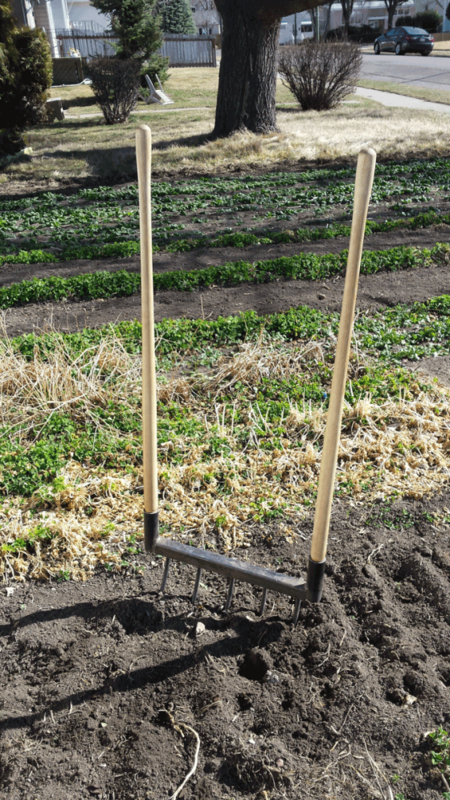 Like machine tilling, this needs to be done only once or twice a year to maintain excellent soil and growing conditions for your plants. Perhaps the standard model isn’t exactly what you need. 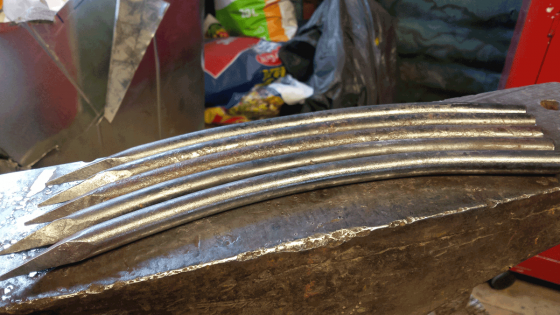 While I’m happy to forge a standard broad fork design, I’m also willing and able to work with my customers to make sure you get the exact tool that fits you and the job you want done. Get in touch with me to collaborate on a custom, and unique, heirloom quality tool.